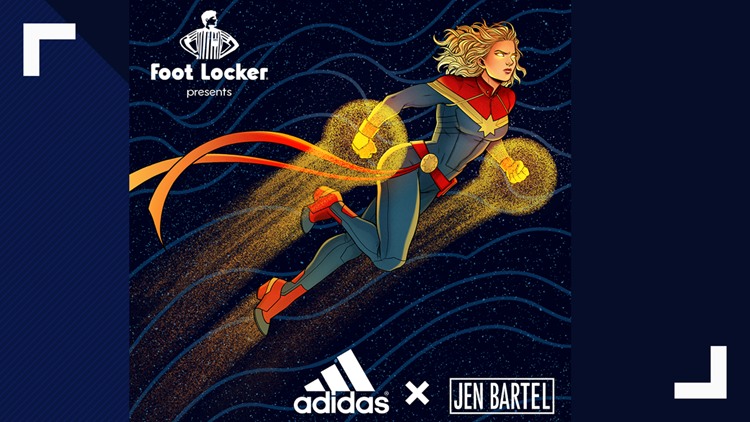 The Jen Bartel x adidas Captain Marvel shoes have been revealed! Artist Jen Bartel, currently working on "Blackbird," worked with adidas to design Captain America themed shoes and she finally revealed them on her Twitter. They're an incredible mix of nerd and function. But most of all, they were so worth the wait! Bartel said in a following tweet that she was overwhelmed with all the love. There is no word on price yet but the shoes are dropping on March 8, that's THREE DAYS FROM NOW, in case you didn't know. They are in partnership with adidas and Foot Locker, so keep your eyes peeled if you want art on your feet.